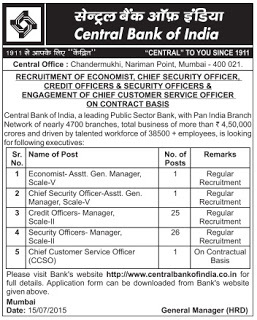 Central Bank of India Recruitment 2015 of Economist- Assistant General Manager, Scale-5, Chief Security Officer, Credit Officer, Security Officer, Chief Customer Service Officer Posts. Candidates who are eligible and interested they can apply downloading Application form from its official site before last date. Candidates also check other details related to Central Bank of India Recruitment 2015 like how to apply, selection process, age limit and more details are given below. Selection Process: The eligible shortlisted candidates will be called for personal interaction and the decision of the Bank in this regard shall be final. Application Fee: Rs.1000/- payable by way of Demand Draft (DD) drawn on any Nationalized Bank drawn in favour of “Central Bank of India – Recruitment of Economist” and payable at Mumbai.